Selections from The Star Wars Saga composed by John Williams. Arranged by Michael Story. Concert Band. Concert Band. Pop Young Band. Movie; Pop/Rock. Grade 2.5. Conductor Score & Parts. 260 pages. Duration 5:55:00. Published by Alfred Music (AP.24754).Something for everyone! 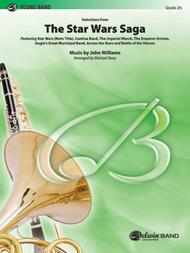 Michael Story has expertly selected and arranged titles from the completed series of Star Wars® films for young band. Title are: Star Wars® (Main Title), "Cantina Band," "The Imperial March (Darth Vader's Theme)," "Augie's Great Municipal Band," "Across the Stars (Love theme from Star Wars®: Episode II)," and "Battle of the Heroes." "May the force be with you" as you perform this popular piece!